Otto Humm is a German physician (MD). Of the numerous eyewitness reports on the concentration camps and alleged extermination sites of the Third Reich, one often finds reports by former inmates describing atrocities committed by SS personnel while these witnesses were hospitalised in the camp's hospitals due to a severe typhus infection. The best known example may be that of Jacob Freimark who, while recuperating from typhus in the hospital of the concentration camp of Auschwitz, claimed to have seen numerous murders committed by an SS man. 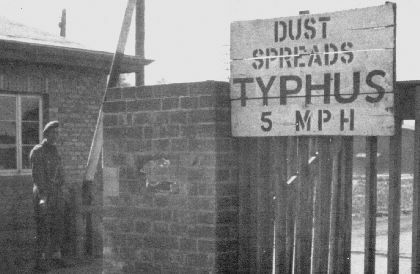 It ought to be uncontested that typhus epidemics occurred frequently in many camps of the Third Reich, the Bergen-Belsen and Auschwitz camps probably being the best known examples. Thousands of inmates and also members of the camp personnel became ill, and many of them eventually succumbed to the disease. The reason for the horror in the German camps at the end of World War II can hardly be better explained than by this photo of the British guard post at the entrance to the liberated, yet still contained Bergen-Belsen camp. As a physician experienced in the diagnosis and therapy of this ailment, I noticed the time correlation between severe outbreaks of this disease and the alleged experiences of such fantastic atrocities of the SS, so that I will be more explicit on the symptoms of the disease in this report. Until the last century, typhus (also known as war fever, tabardillo, European typhus, jail fever) and dysentery killed more people during any war than did wounds inflicted by armed conflict. After 1914, typhus could basically be controlled through annual vaccinations in the German army. A typical symptom of European typhus is the patient's marked psychosis at the peak of the illness, a state of incessant state of delirium. Typhus comes from the Greek "t uj o s " meaning stupor, referring to the frenzy developed by the sick. As a specialist for internal medicine, I encountered only a few cases of typhus, which were all mild due to vaccination, while serving at the military hospital (no. 2/529) in Russia. Dialogue cured the convalescents from their illusions. After the war, I often treated cases of typhus, albeit antibiotics existed at this time, which curbed the development of the disease so that the once common state of stupor did not occur. "March 17th. Today I'll be doing something unique; I'll be driving to Chilowo in order to see cases of typhus with patients accommodated in a designated hospital. I need to learn more about the symptoms, because typhus comes with a number of severe surgical complications. Chilowo lies to the north of the road to Pleskow. A car can barely reach it, since huge ice-capped snow dunes always block the way, especially when we have to leave the main road. Nevertheless, we reach the hospital in Chilowo in a relatively short time. Upon my request the commanding GP, a medical doctor of internal medicine, brings me to the station for typhus. Initially, I don't really know what he means, but I will find out in a minute. He presses the knob of the broken, wind torn door. The hinges creak. We enter a poorly lit room, accommodating about twenty men. A slim door leads to adjacent rooms where the most severe cases of typhus are stationed, people who had to be isolated due to complications, and ... the dying. The first impression is grizzly. Three men actually move about in stupor. One taps along gesticulating, mumbling about, going from bed to bed. He does not know what he is doing or saying, or where he is. Another tries opening a window, apparently wanting to leave. An orderly holds him gently, trying to persuade him to stop, but he understands not a word. There is no reply, no reaction, the patient seems to follow his inner urge, and like an obstinate animal he will not alter his attitude. A third with a swollen red discoloured face and reddened eyes meanders about with threatening gestures but with an absolutely absent look to his eyes; he staggers towards us. While shouting, he keeps coming closer and closer. One gets the impression that he takes us for Russians. We quickly grab his arms, try to sooth him, to turn him around, to bring him to his bed. He screams in brute panic, thrashes about violently, and defends himself so that two other orderlies have to help us contain that insane man. We finally manage to lay the poor, totally disoriented chap down and to cover him with a blanket. An orderly remains at his side. Mass grave of typhus victims at Belsen; right: British liberators deliberately exposed SS women to contagious diseases. Beside him lies another soldier with wet compresses on his forehead. A nurse says he has a severe headache. His face is also red and swollen. He suffers from a severe form of conjunctivitis, a typical symptom of typhus in the early stages. This emaciated man is not at ease in his bed. He is befallen with a curious tremor of his hands and arms, single muscles keep twitching and he makes curious uncoordinated movements with his limbs. Sometimes his neck is so spastic that his head buries itself deeply into the pillow. He then gnashes with his teeth in such a manner that it goes up and down our spines. These are the symptoms of meningitis, which is also accompanied by muscular spasms and stiff necks. This reminds us of tetanus. During interim periods, the face of the man seems motionless, rigid, masked, without mimicry. Then involuntary, uncontrolled, erratic grimaces overcome the face. What I want to say is that no noticeable facial expression prevails. That's what gives the countenance such an uncanny, sick expression. This mental disorder expressed itself directly. The man is out of his senses. He doesn't answer inquiries properly and doesn't know where he is. His deep-lying eyes have a feverish glance. We pull up his shirt to inspect his skin. This is the first time I see the atypical red rash, exanthema and, skin hemorrhage. The man is, like all typhus patients, undernourished, in fact fully emaciated. Because of his high fever, his skin is extremely dry. His lips are parched and split, his tongue parched and coated. He coughs a lot and speaks in a hoarse voice. The nurse explains that he has difficulty swallowing, choking quite often. Of course this is dangerous. Even his speech is incoherent, proof of brain malfunctioning. His words are completely vague. In odd apoplexy, he just stammers something between his teeth. I keep getting the impression that the claim that typhus is predominantly a disease of the brain, i.e. a form of encephalitis, is correct because the most apparent symptoms are all related to the brain's malfunctioning. This would explain the senseless rounds, the total disorientation of the afflicted, the erratic speech and finally, the colossal stupefaction. On all fever charts, we see uniform and rhythmic curves and notations of low blood pressures. This can only indicate a failure of the circulatory system. Blood vessels swell; lose their tension, thus causing a reduction of the blood pressure. The spleen of all the encumbered is swollen. The understanding colleague for internal medicine does not say much. He lets me observe it, see, feel, and work at it. I am not influenced at all in the sick bay. He notices that all my senses are set to perception and does not want to disturb my learning process. I am very grateful for his attitude. Reminiscing upon all these impressions, it seems that because of the generalized vessel damage, symptoms pertaining to nearly all tissue and organic defects are the central feature of this extraordinary disease. On this basis typhus can instigate or promulgate intestinal paralysis and diseases of the central nervous system. Since this infection holds a lot of unanswered questions, proper diagnosis respective to differential diagnosis must be very difficult. Photo Forgery by Treacherous Captions: The allied occupational forces made photos such as these of the liberated concentration camps of the Third Reich by the thousands. The manifested interpretation that the emaciated corpses were the victims of National Socialist racism is nevertheless ill founded – here two pictures from Markus Tiedemann's "In Auschwitz wurde niemand vergast" (Nobody was gassed in Auschwitz, Verlag an der Ruhr, p. 131f.) with similar misleading subtitles. Cause of these deaths was malnourishment and lack of medical supplies toward the end of the war, when the infrastructure of the Third Reich collapsed. Numerous such human mounds were scattered all over Germany, because millions lay on the battle fields, in the bombed cities, were frozen, slain, or died due to starvation along the escape routes for the 15 million east and ethnic Germans. "Photo document of May 1, 1945: A Polish Jew in a satellite camp of Kaufering by Landsberg in front of the corpses of murdered co-inmates"
As a matter of fact: the emaciated, dehydrated corpses prove that these inmates died of typhus. "Photo document of 1945: Climax of Racist Politics: A mass grave of a concentration camp as found by allied troops." We continue walking and come to a person who arouses my special interest, because the tips of his fingers and toes, including finger- and toenails, have a deep bluish-purple hue, as if necrosis were taking place. No doubt due to deficient blood circulation. Astounded I ask my colleague whether he has experienced any loss of limbs, because this does look like third degree freezing. He ascertains that in the course of the ailment the phalanges will not die off, they will heal eventually and there is no need for amputation. Now it's obvious why so many false diagnoses can be made. We rush to the site and find a totally emaciated patient with severe symptoms of asphyxia. His face has turned deep purple, his pulse barely palpable, irregular, and hectic. He is apoplectic and struggles for breath – his trachea must be obstructed. I immediately project my finger to the base of his tongue and palpate a soft mass, which completely engulfs the trachea. Artificial respiration by applying manual thoracic pressure will not make sense nor lead to success. If nothing decisive is done, this man will die. We grab and transport him quickly to an adjoining room, apparently the first-aid post. The orderly restrains him. One gives me a vessel with a few instruments soaked in antiseptics. Fortunately I also see a scalpel. This must suffice. I quickly take off my uniform, roll up my sleeves and allow the head of the suffocating man to be bent back. I cut an opening into the trachea without taking any preliminary antiseptic precautions in this dire situation. I perform a tracheotomy. This is possible since the man has lost consciousness and is thus fully relaxed. It's uncanny how little blood flows. As soon as the scalpel has opened the trachea wide enough, I place a scissor into this gap and open it. The man doesn't breathe any more. My college must begin artificial respiration, while an orderly lets oxygen flow into the tracheal cut. An immediate intravenous injection of 'Coramin' follows. We succeed. After a few minutes his somewhat spastic breathing begins, becoming regular. 'Coramin' works wonders. However the man remains in a deep coma. We are deeply embarrassed, because we have no tracheal tubing. I cannot remain here hours on end holding an opened scissor. At this station for internal medicine, no one apparently took such a severe case into consideration. What luck that at least a knife and a scissor were at hand. We must find the means of keeping the trachea open. 'Do we have a stark rubber or garden hose which could be used as a provisional tracheal tubing?' I ask. The orderlies disperse and return with a piece of rubber tubing. We adjust a small piece, plugging a safety pin at one end of the tubing. Then it is disinfected and placed into the trachea, pinned to the neck of the patient. A continuous flow of oxygen passes the provisional tube. Already we believe we have saved the man, but one can never be sure in this passive stage of patients with typhus. In spite of all our efforts, the soldier dies in the evening hours of cardiac arrest. His corpse is deathly cold. Darkness fills the room. We still sit together when this sad news reaches us. I immediately ask for a dissection. The corpse is brought into a cool room of the cellar and Prof. Schmidt is notified. He wants to come to Chilowo the next morning to do the autopsy. We all watch him. Not only does he discover lesions of the thoracic mucous membranes, which no doubt developed because of the extreme dehydration of the pharynx and thorax, but also profound ulcerations of these organs. An infection around the ulcers caused a sudden swelling of the glottis and throat; the feared glottis oedema developed, which obstructed the air passage causing the nearly mortal asphyxia. Schmidt also demonstrates that the infectious process spread into the surrounding area. An impending destruction of the glottis is already developing. Thus it is of utmost importance that dehydration of the mucous membranes of the mouth and sinuses be averted while treating typhus. We keep pondering, which proper measures can be taken. The autopsy has revealed important information. After Schmidt finishes his sad work, I return with him to Porchow. We hardly speak, each of us pondering. Schmidt is probably thinking: what more will happen?" The state of hallucinations of the diseased can be partially responsible for claims bordering at the absurd and unreal, i.e. assertions which are scientifically and technically impossible. For instance, what could a typhus patient do, when in his stupor he saw SS men throw children into open flames or inmates of the special commandos pour human fat onto the burning corpses of their slain comrades? Nobody would have cared for these sick inmates in order to cure them from their hallucinations. The stories of these typhus patients probably made their rounds amongst the inmates who on their part generated rumor and atrocity stories. The numerously documented incidents of extremely emaciated human beings in the concentration camps of the Third Reich (so-called 'muselman'), especially at times of typhus epidemics, are to be explained as unavoidable symptoms of typhus and not as proof of deliberate malnutrition of the interned. Medicine in the late thirties and early forties of the last century was not capable of describing all indications of typhus and had no means of a proper treatment. It was a time of learning (circumstantial symptoms). The high mortality rates of inmates in the camps of the Third Reich were not due to lack of proper care. It has been proven, especially at Auschwitz, that enormous efforts were made to fight and cure the disease. Thus, legal responsibility lies not in the circumstances leading to the death of so many inmates, but rather in the reasons for the internment of those inmates, many of which were incarcerated without due process. "Most of the memoirs and reports [of Holocaust survivors] are full of preposterous verbosity, graphomanic exaggeration, dramatic effects, overestimated self-inflation, dilettante philosophizing, would-be lyricism, unchecked rumors, bias, partisan attacks and apologies." For many years now, the special socio-psychological effect, which the traumatizing culture of Holocaust remembrance has on holocaust survivors, is described as the Holocaust-Survival-Syndrome (HSS). According to this, memories of real experiences of the survivors are continuously overwritten by accounts and reports from others. As a result, the survivors themselves became a social group, relentlessly influencing each other, generating a psychological of group fantasies and of martyrdom in the process. Prof. Dr. Elisabeth Loftus, North American expert for eyewitness criteria, has shown another approach to explain unlikely or simply false witness statements. She describes the conditions, under which humans are incapable of distinguishing between actual experience and hearsay. It seems that especially under emotional stress our brain's control mechanism to distinguish between real memories and mere illusions or hearsay breaks down. This fourth attempt to explain delirious fantasies of those stricken with typhus is not meant to replace the approaches already mentioned. It simply adds another possibility in the attempt to explain the occurrences of witness statements that sound fantastically unreal. First published in Vierteljahreshefte für freie Geschichtsforschung, 1(2) (1997), pp. 75-78; translated by Dr. Harald Hortig. Cf. Claus Jordan, "The German Justice System – A Case Study," in: Germar Rudolf (ed. ), Dissecting the Holocaust, 2nd ed., Theses & Dissertations Press, Chicago, IL, 2003, pp. 145-179. Imperial War Museum, Horror 8 BU 4092. Heggelin, Differential-Diagnose innerer Krankheiten, Thieme Verlag, Zürich 1951. Hans Kilian, Im Schatten der Siege, Ehrenwirth, München 1964, pp. 220-225. Left: Imperial War Museum, Horror 9 BU 3744; right: www.scrapbookpages.com/BergenBelsen/BergenBelsen05.html. Samuel Gringauz, "Some Methodological Problems in the Study of the Ghetto," in: Salo W. Baron, Koppel S. Pinson (eds. ), Jewish Social Studies, Vol. XII, New York 1950, pp. 65-72. Polish Historical Society, News release, January 25, 1993, 91 Strawberry Hill Ave., Suite 1038, Stamford, CT 06902, USA; cf. Paul Chodoff, "Post-traumatic disorder and the Holocaust," American Journal of Psychology – Academy Forum, Spring 1990, p. 3. Elizabeth Loftus, The Myth of Repressed Memory, New York, 1994; see the series of articles on this topic in The Revisionist 1(4) (2003), pp. 456-466.